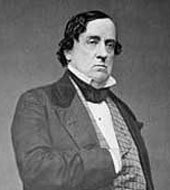 Lewis Cass was appointed Secretary of State by President James Buchanan on March 6, 1857, and assumed office the same day. He served until December 14, 1860. Cass was born to a farming family in Exeter, New Hampshire. His father joined the Continental Army in the Revolutionary War and fought under General Washington at Bunker Hill, instilling in his son a deep sense of patriotism. Cass attended Phillips Exeter Academy. Upon completing his education in 1800, he left with his family for the Northwest Territory of Ohio. In Ohio, he became a member of the bar, practicing in the town of Zanesville, Ohio. In 1806, Cass was elected to the Ohio House of Representatives. The following year, President Jefferson appointed him as U.S. Marshal for Ohio. After serving during the War of 1812, during which he was promoted to the rank of General, Cass was appointed Governor of the Michigan Territory. He served in this capacity from 1813 until 1831. That same year, President Jackson chose Cass to serve as his Secretary of War. At the conclusion of his term, Jackson appointed Cass U.S. Minister to France, a position he held for six years. Cass failed to secure the Democratic presidential nomination in 1844 and in 1845 became a U.S. Senator from the state of Michigan. After serving in the Senate, Cass secured the presidential nomination in 1848 but lost the election. He returned to the Senate for eight more years and failed to receive the presidential nomination in 1852. President Buchanan appointed Cass as Secretary of State in 1857. President Buchanan appointed Cass Secretary of State with hopes he would unify the Democratic Party then riddled with sectional tensions. An experienced diplomat and former Secretary of State, President Buchanan aggressively directed foreign policy. Two focal points of the Buchanan administration were Latin America and Great Britain. Internal dissension from antislavery proponents, sparked in part by the attempt to purchase Cuba from Spain, often thwarted Buchanan’s foreign policy plans. Attempts to purchase more territory from Mexico were also frustrated by an increasingly divided Congress and disinterest on the part of Mexican leaders. Nonetheless, Cass successfully negotiated a final settlement of the Clayton-Bulwer Treaty with the British Government. The treaty limited both U.S. and British control throughout Latin America. The British also relinquished their claim to the right to search U.S. vessels under Cass’s tenure. With the election of Abraham Lincoln and the rise of the new Republican Party, Cass began to voice his long-held disagreements with the Buchanan administration, specifically his protests related to sectional differences. Cass tendered his resignation in the last days of 1860.